Refugio - She Loves Surf! Refugio - She Loves Surf! A few weeks ago my husband and I took off up the coast for a road trip without the kids. I was done teaching for the semester, he was ready for a break from work, and it was time to relax, surf and spend some time near our roots. 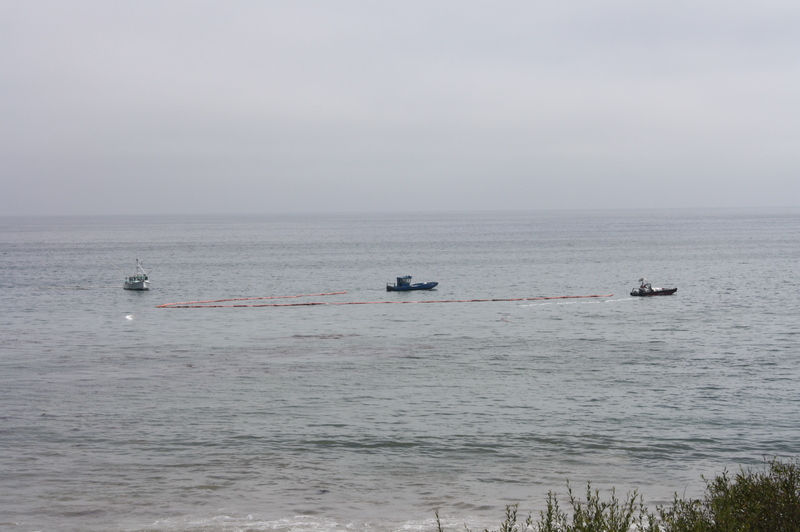 The week before we were set to leave a disaster occurred, the Refugio oil spill. Certainly you’ve all heard about this event and likely you tracked it on the news or social media. When I first heard of the spill from a friend who lives in Santa Barbara County I immediately felt ill. Without knowing the extent of the event, I feared the worst, and I knew that even a small spill would have devastating impacts on marine life in that area. During college at UCSB I spent hours underwater near Refugio, nearby Naples reef (recently designated a marine protected area) was one of the study sites I worked at, and a small nearby reef and surf spot, Tajiguas, was the spot of my very first and very magical night dive. Memories of the beauty of this stretch of coastline flooded my mind, and the thought of muddy oil covering its inhabitants darkened my spirits. As details of the spill including the volume were spewed out on the news I realized that marine life along that stretch of coast would be in peril for months and even years, and my heart sank further. 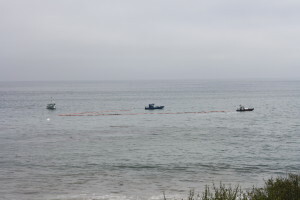 Boats using nets to encircle the oil and try to sweep it up. As we drove by Refugio just over a week after the spill I stopped to take photos. I observed the clean up efforts and the people hired to attempt to alleviate the damage. The people working on site observed me right back, and although they didn’t say anything to me, I felt the vibe of “get outta here and stop documenting the crime with your camera”. I smelled the extremely pungent crude oil in the air, and observed workers wearing protective breathing apparatuses, even along the 101. Now, over a month later, news is dwindling, yet clean up efforts continue. Of course there were immediate reports of oil plumes extending all the way into Los Angeles, and beach goers anywhere in California were blaming any and all tar on their feet on the spill. I personally ended up with more tar on my surfboard and even more on my feet than I’d ever seen after a Ventura surf session. Was it from the Refugio oil spill? I’m not sure. Did it feel slightly sketchy to be surfing so nearby a week after the spill. Yes! There is an ongoing study attempting to identify the source of tar balls found south of Santa Barbara County, but those results are limited since the tests were only done on a few tar balls, not all of them. That being said, one tar ball found in Manhattan Beach was matched to the Refugio oil spill. As of today, El Capitan State Beach near Refugio is scheduled to reopen this weekend, and apparently 93% of the oil that can be seen has been cleaned up. The oil company has spent 92 million dollars on clean up efforts thus far. 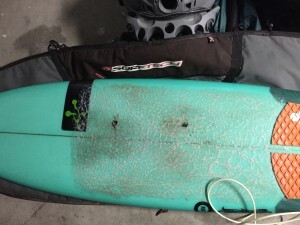 My beautiful board with oil graffiti spots. I know this topic is extremely depressing. I’m not writing this post to depress anyone. I’m writing this post to pose a few questions to you, fellow lovers of the ocean: 1) Has the Refugio oil spill slipped your mind recently? 2) If so, what can you and others do to keep the news fresh and important, and to follow up on the cleanup progress and damages? 3) Lastly, what can we do to prevent events like this from happening in the future? I ask these questions not to make anyone feel guilty about driving a car that uses gasoline (I drive a car) or for having other things to think about besides sad environmental issues. I’m asking these questions to see what really can be done, and to remind everyone that although this topic is about to become no longer “newsworthy”, the cleanup efforts continue and the effects of the event will linger. Long after 100% of what we can see is cleaned up, what we cannot see, underwater, will continue to feel the effects of this monumental blunder.